“Tag Their Mother or Delete The Photo” – Sister of Jude’s Wife Calls Out Paul Okoye’s Wife. The Okoye’s family are back on the media. We’ve read and seen the problems between the Psquare brothers and here is another. It seems all is not well with Paul Okoye’s wife Anita, and Judee Okoye’s wife Ifeoma. Earlier today, Paul Okoye’s wife reposted a photo her husband’s brother shared of his daughters. 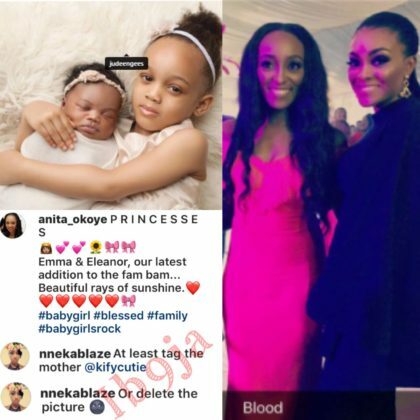 And she captioned the photo..
Then the unexpected happened, the sister to Jude Okoye’s wife, decided to attack her for posting her nieces photos and not tagging their mother…. She soon deleted it, but a screenshot was obtained by Instablog. Check it out below…. Paul Okoye’s wife Anita has since tagged their mother.. And below are reactions from fans.